It’s that time of year again…holiday prep time! I wanted to kick off my Holiday Prep series this year with a look at custom holiday cards. I’ve sent out a photo card every year since Don and I got married. This is our tenth holiday season as a married couple and over the years I have tried several different photo card providers, including everything from high end custom stationary companies that you order from within a shop to Martha Stewart for Kodak Gallery (now Shutterfly), Paper Source, cards I’ve edited and ordered through iPhoto on my Apple computer, and most recently, Tiny Prints. All of these have been wonderful cards that I’ve loved. This year I was surprised and delighted when the lovely folks at ErinCondren.com reached out and offered to provide me and Don with our holiday cards this year. As a HUGE fan of the brand, I was more than a little excited about this generous offer. They sent me a nice variety of sample cards from this year’s collection for me to look at in person before choosing to order. I was blown away by the quality of not only the gorgeous designs, but also the crisp printing and thick cardstock used for in their lineup. ErinCondren.com has four overall holiday card categories to choose from. Their Premium Cardstock Classic Collection includes 39 different designs to choose from with different color schemes for many of the options. There are also several layouts of each design available, with possibilities ranging from the 10H or 10V (3.875″ x 9.5″ with horizontal or vertical orientations), a square design (5.5″ x 5.5″), the Z Fold (4.25″ x 5.5″ folded that opens up to 16″), and the classic A7 (5″ x 7″). The Premium Cardstock Postcard Collection includes 15 designs with some different color palette options that measure 4.25″ x 6.” These are great if you want to keep things simple without the need for envelopes and return address labels. They also offer Premium Cardstock Non-Photo Cards if you’d like to take advantage of one of their beautiful designs without the need for a photo. There are 8 designs to choose from in the A7 size with several designs offering different color palettes. All cards come with one free design proof and are available in either their premium 130 lb cardstock or a double-thick 260 lb card stock. You can also opt for rounded off corners or stick with the standard squared ones. I immediately fell in love with the gorgeous Double-Thick Foil Collection. Talk about a deluxe photo card! There are two designs offered in this collection, including the Fleur Feliz and Paisley options. Each design is offered in several color palettes, including green, blue, and red (as well as brown in the Fleur Feliz) and three orientations, including vertical, horizontal. and a collage style. The Fleur Feliz has a gold foil stamped backing and the Paisley has silver. Each is constructed with double thick cardstock and comes in the A7 size. 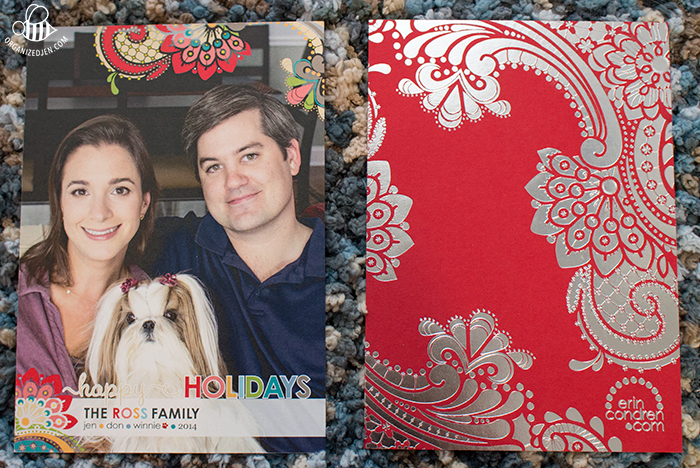 I chose the red vertical Paisley design, because I really like the bright and playful color palette on the front and the orientation fits our holiday photo nicely. I found it very easy to upload and format our photo on the website using their included software. I love how our cards came out! I left a specific note for the desginer addressing my concerns about the paisley design cutting into Don’s head and they did a wonderful job formatting it so it’s just right. One of my favorite details of the card is the little pawprint they added nexct to Winnie’s name, which was a surprise bonus I didn’t know about until the design proof came through. All in all, I am very pleased with the final result and can’t wait to send these to our frtiends and family. Once you’re done formatting your custom cards, you are given the option to pick out what color envelope you’d like. Out of the thirteen options provided, I decided on red to match the overall tone of our card and give a nice holiday feel. I also appreciate that I was able to order some extra envelopes, which come in handy in case of a labeling error in our holiday card assembly line, which is known to happen from time to time at our house. I also jumped on the chance to order custom return address labels to match. I’ve always liked to include a sticker seal on our envelopes for that extra special touch and usually buy inexpensive ones at an office supply store. By using the gorgeous ErinCondren.com custom ones this year I not only save myself having to print out return address labels, but they really tie the whole presentation together with the matching design. In addition to our photo cards I like to include a holiday letter every year as a way to keep our loved ones both near and far in the loop with our lives. Lately I’ve taken to formatting and printing these out on nice heavyweight paper half sheets, which we then fold in half before placing in the envelopes with the cards. That way I can include as much information as I want without worrying about formatting to fit inside a card’s design or a fancy printed paper. While I’ve done both in the past to great effect, I’ve decided with such beautiful card designs in recent years that including a simply formatted holiday letter seems fitting. One last special touch I like to add for that extra pizzazz are custom photo stamps. I’ve created and ordered mine through Zazzle for years now. It’s just a little thing, but every year I get a lot of positive feedback about how people enjoy seeing our little Winnie right on the envelope! The editing widget included on the Zazzle website is easy to use and true to the final product you receive in the mail. Zazzle is also a great resource for many different customized items, which make for great holiday gifts. There are some awesome promotions happening for a limited time only right now. Save 30% off your holiday card order at ErinCondren.com with code BEJOLLY30 at checkout, good through November 13, 2014. You can save 15% on your custom photo stamps at Zazzle.com with code VETERANDAY14 at checkout through November 11, 2014. These are great savings to take advantage of this week and get your holiday card and stamp order in early! I am so excited to be hosting two giveaways to kick off the holiday season! Giveaway #1 is an Erin Condren Gift Card giveaway. There will be FIVE winners! The Erin Condren Holiday Card Gift Card Giveaway will run until Monday, November 17, 2014 at 6 PM CT. 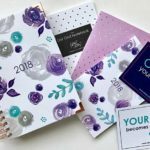 The giveaway is open internationally (you can find information about Erin Condren international shipping costs here). All entrants under the age of 18 must have parental permission to enter. Five winners will receive a $200 electronic gift card for use at ErinCondren.com. You can enter by following the directions in the Rafflecopter widget posted below (check out this blog post for more information on entering Rafflecopter giveaways). I’ll announce the winners on THIS blog and post contact the winners directly through email. Good luck! Congrats to the winners of the Erin Condren Holiday Card Gift Card Giveaway! Giveaway #2 is a generously provided by the lovely folks at Zazzle. Three of you will win a $25 electronic gift certificate. The Zazzle Custom Stamps Giveaway will run until Monday, November 17, 2014 at 6 PM CT. The giveaway is open to US participants only. All entrants under the age of 18 must have parental permission to enter. Three winners will receive a $25 electronic gift card to use at Zazzle.com. You can enter by following the directions in the Rafflecopter widget posted below (check out this blog post for more information on entering Rafflecopter giveaways). I’ll announce the winners on THIS blog post and Zazzle will contact the winners directly through email. Good luck! Congrats to the winners of the Zazzle Custom Stamps Giveaway! Big thanks to Erin Condren and Zazzle for their generosity! Even if you decide to go with other providers, I hope this post gave you some ideas and perhaps a little gentle nudging to get your cards purchased or made and ready to go in advance to save yourself a little last minute stress this holiday season. I’ll be back soon to share even more holiday goodness with you! It’s the most wonderful time of the year! Hi Jen, Will you be doing Vlogidays this year? I really hope so! Your Vlogs cheer me up and we definitely had a rough 2014. I’m sorry to hear you’ve had a tough year. I do plan on vlogging during the holiday season. I’m so excited about your holliday series! I watch every year. REQUEST ……. could you do a children’s series? I know you buy for your nieces I would love just one full video on what and how you do just their stuff. I had to stop hosting that because it got pretty overwhelming. It was fun tho and if I could manage it I would love to do it, but it’s just not feasible with the amount of cards I have received in the past and would conceivably get in the future should I hold it again. I’ve started watching your channel this past year. It’s great and I look forward to watch all your new post. Your Christmas cards look great. I always put a photo in our cards, it just seems to make it extra special. I love watching your holiday prep videos. It gets me excited for the holidays. I remember last year you had the spritz cookie recipe. Thank you for making the recipe available to us. I made them and they came out so good my family ate them all before i could try one. Thank you for your positivity & generosity! Thanks for the opportunities. I don’t think you truly understand what you’re doing when you accept gifts from a company, then give that company glowing reviews. You are advertising for them. You are encouraging people to spend outrageous amounts of money on that company’s products – people who will buy things just because you like them! I understand that you truly like their products, but what you’re doing isn’t right. You accept gifts, then endorse that company. Then they send you more gifts. Can’t you understand how wrong that is? Of course I know that many of my posts end up being effective advertising for companies, but honestly I do not see the wrong here. That is just my opinion and you are entitled to yours. I hope people know enough to spend their hard earned money on things they genuinely need and want. I choose to share about things I am genuinely interested in and excited about regardless of whether that product has been gifted to me or not. I always make it crystal clear when companies contact me wanting to send product that in doing so I do not guarantee a review or even a mention of their products and that if I do choose to I will always give my honest opinion and feelings in my content. And I try to be as transparent as possible in my content when product has been provided. Thanks of your videos I have discovered companies and products but I have my own opinion and, as you say, everyone is able to make choices. I don’t think you are doing it wrong. Keep you going Jen ! Jen, You are more than transparent. As I mentioned in my post of today’s video, you are the most generous Youtuber on the planet. You are honest and very giving. I can’t think of one other Youtuber that gives back as much as you do. When people start their rant and start caring about this frivolous stuff regarding being an affiliate, etc. You need to ignore them. They make themselves sound petty and foolish. Those that have been watching you from the beginning, as myself, know that you would not and do not give a company a raving review to receive a kick back. That is ridiculous. Keep doing what your doing Jen. Most of us couldn’t care less what you receive from a company and know that regardless, you’re an honest person that doesn’t need to sell yourself out. You work very hard and put in many hours and I say you deserve anything they want to give you. Thanks Jen! I’m excited to see what all of your holiday prep series is this year. Thank you for being inspirational, motivational, and generous. So excited for another holiday prep series! Also, you have such a joyful spirit! Its refreshing to watch. I know sometimes you receive mean comments which I will never understand why anyone would want to judge you and/or just be cruel, but stay strong in knowing you truly have an audience that enjoys your content! Now, I have to get organized and order our cards (thanks for the push)! Your Holiday themed OJ videos and MHWL vlogs are probably my favorite! Such a wonderful time of the year and I always look forward to watching them! This will be my 2nd year as a married lady and I think we are doing cards this year! I am definitely going to look into these as an option! As always, thanks for sharing! Really loved this post I always hand make my cards but working full time sometimes I literally run out of time at Christmas. I live in the UK so sadly won’t be able to use the same offering but you’ve really inspired me to see if I can find something similar here. I’m so looking forward to the rest of your holiday series you give me some fab ideas. beautiful picture of the family for Christmas. I just love the stamps, Winnie is so cute on them. I must admit that I’m more traditional for the design of my cards. Here, in France, it’s not a tradition to send picture. I usually create my cards. Thanks for the review and for inspiration. Can’t wait to follow you in the Christmas’s journey. Those are some lovely looking cards Jen, I wish we had as many options for card customisation as you do, here in the UK. We normally send cards from a “bulk box” we buy from the store. But I think next year we might send out some custom cards to close family. Absolutely love reading your posts and watching the vlogs, they are full of so many great ideas, that I can bring into my own life. Those foil cards are absolutely gorgeous! We ordered holiday cards through Erin Condren last year and loved them. 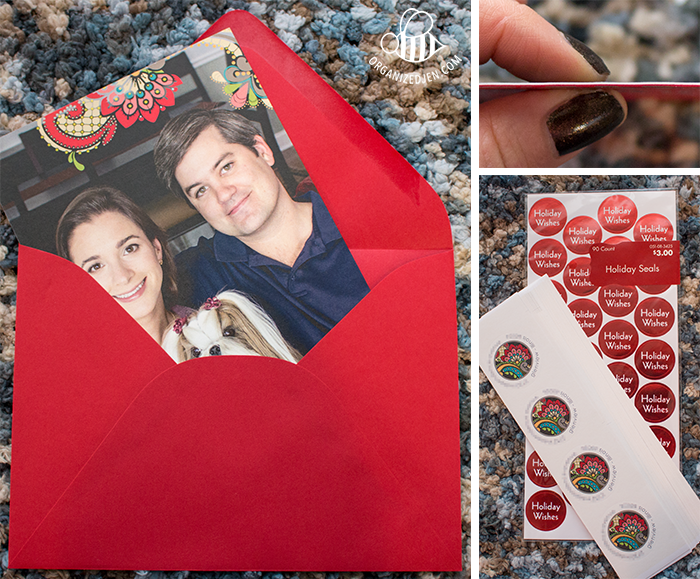 It was our first experience ordering personalized holiday cards and the quality and service really just can’t be beat. When I saw your video I was reminded that I wanted to get my order in early this year, so I ordered our cards (the non-photo Paisley design in red and white) last night and ended up having some trouble with the discount code – it was applied in my cart but then disappeared when I received my order confirmation. I don’t know if the representative I corresponded with was confused or if they have made an error on their end, but I was told that the code had expired on 10/31! Thankfully when I pointed out that it was still displayed on their site, they made it right. I don’t know if anyone else has had this issue but folks may want to check with EC before ordering just in case! They keep extending that coupon so that might be where the confusion is…hopefully they’ve straightened it out and you got your discount! So awesome to have this video nice and early too, thanks for that! You have inspired me to get moving on my holiday cards and we took our holiday photo yesterday and I have created and ordered my photo holiday cards! I can’t wait to get them them! 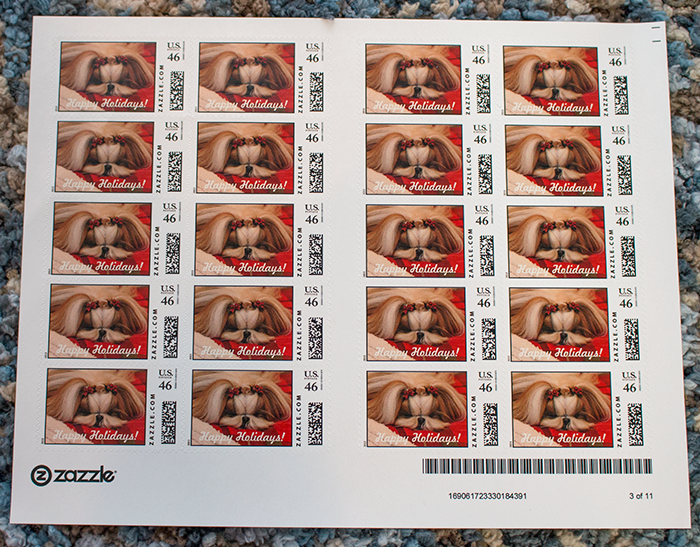 Love the custom holiday stamps too – I’m totally going to customize my own stamps this year as well! Would make the perfect extra special touch to the holiday cards! We always do a photo holiday card every year as well and have for the past 8 years and we always get a ton of feedback from our friends and family saying how they look forward to “seeing” us every Christmas on our cards and that they most look forward to receiving our special photo cards! I really enjoyed watching the vieo, all te beautiful cards you showed are so beautiful and you and your husband are so pretty! i actualy live in Tunisia, is it ok if I entered?sometimes they say interntional shipping but they dn t send to evry country. Anyway, i cross my fingers! The ErinCondren.com gift card giveaway is open internationally. The Zazzle one is not. 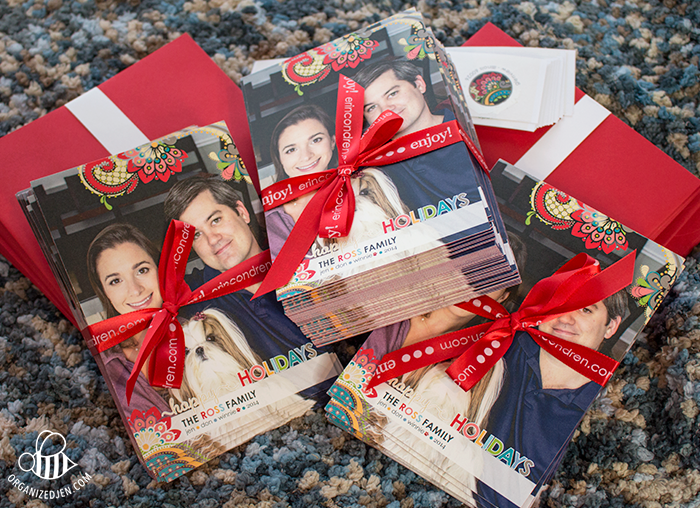 Thanks for this awesome giveaway…Your holiday cards are beautiful. I enjoy all your vlogs and always look forward to your reviews in the products that you use and are trying out. I can’t wait to try some of the lush holiday bath products this year. Are you going to be doing a lush holiday vlog? If so I can’t wait to view it. I hope you’ll be able to do vlogidays this year as well, I love those vlogs, it always puts me in the spirit for the holidays. Thanks for sharing Jen. You, Don and lil Winnie have a good upcoming weekend. I don’t plan on buying anything for myself since I tend to get LUSH stuff as gifts. When will you be posting the winners of the Erin Condren gift card?